Address: PO Box No. 1114, GPO, Islamabad. 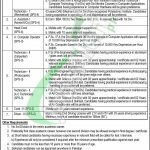 Tap to this page and have Atomic Energy Jobs October 2018 PO Box 1114 GPO Islamabad Career Opportunities. Today on October 2018 we bring an exciting news for the job seekers that latest job opportunities have been announced by a prestigious public sector organization which is looking for skilled and experienced individuals who are willing to perform in a challenging environment against the vacant positions such as (Technician-I (computer Technician)/ Technician-I (Mechanical), Jr. Assistant-I (Admin/A/Cs), Head Cook, Jr. Computer Operator, Technician-II (Carpenter), Technician-II (Photocopier), Technician-II (AC Technician), Cook-II, Driver-III). Selected candidates may be appointed anywhere in Pakistan. Candidates willing to apply should hold relevant qualification and experience as per the criteria and according to the criteria candidates having BSc/BCS/BIT/BBA/BA/BSc/DAE/FSc/FA/Matric/Middle with relevant experience is required to apply. It is the finest opportunity for those who are well educated but wanted to be part of any Federal Government Department which offers a handsome salary package starting from Rs. 20,000/- to Rs. 45,000/- or above. So, only suitable candidates meeting criteria should apply as per the following how to apply procedure given below. Applications along with detailed CV attested photocopies of academic credentials, testimonials, experience certificates, NIC and one passport size photograph should reach the following address given below. Complete postal address and cell no. must be written in an application. Candidates already employed in Govt. / Semi Govt. Organizations must provide NOC from their employers at the time of test/interview. The last date for submission of application is October 26, 2018. Last Date to Apply: October 26, 2018.